Dross results from material that is melted, but not removed during the cutting process, resulting in an uneven surface finish where cuts were made. Older plasma system often required parts to be processed after cutting to remove dross. cut material up to 1.25" without the need for any secondary processing. cut through carbon steel up to 2.5" thick. At Jupiter, the cutting head is controlled by advanced software that takes information from the CAD drawing of the part to lay out all of the indicated part features. The speed of the cutting head is controlled by the software throughout the process, taking the material thickness and cutting geometry into account. These factors are important for attaining maximum efficiency while still providing a clean cut. As a result, we can efficiently cut sheets up to 224" in length and 141" in width. 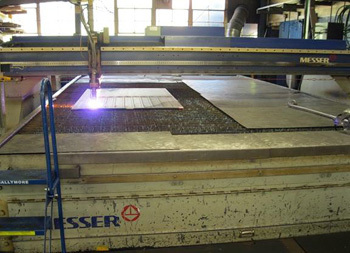 Previously, to process such a wide range of material thicknesses, a shop had to purchase a laser cutter for thin material, a plasma cutter for medium thicknesses, and a flame cutting system to accommodate heavy plate. However, with the advances in technology, we can cut everything from thin gauge aluminum to heavy steel plate using a single cutting table, reducing our operating costs and allowing us to pass these savings on to customers. Whether you need a few prototypes or a high volume quantities, our lead times are among the most competitive in the industry. When quoting a lead time, the scope of the project and the customer's scheduling needs are taken into account to provide a turnaround time that best meets the customer's needs. For additional information about our CNC cutting services, please contact us directly.